Sam Sarr Managing Editor of the Foroyaa Newspaper has called for the erection of a statue of the late Deyda Hydara on the spot where he was gunned down in 2004. Mr. Sarr said, "This will help Gambians to remember Deyda Hydara anytime they see the Statue." He added that such statue will serve as a symbol of press freedom which Deyda represents. The Foroyaa Editor made these remarks during the Commemoration of the 13th Year Anniversary of the Murder of Deyda Hydara, which was held on Saturday 16, December 2017. Scores of relatives, media practitioners and friends of Deyda Hydara converged on the spot which is located on Sankung Sillah Road just behind the premises of the Police Intervention Unit . Some personalities close to Deyda made remarks. On his part Baba Hydara the son of the late Deyda said, "My Father was using the Pen for the truth, but they used their guns to kill him". He said that his father was a man of dignity who was fighting for the truth, as a result he was killed. "My father has contributed a lot to the promotion of freedom of expression and the development of the Media in the country," he highlighted. Mr. Pape Saine Co-founder of The Point and a colleague who has been working with Deyda said, "Deyda was killed based on two things, the first one is he was critical of the Government on human right violations and the second is he was about to file a case against the government on the bad laws that restrict freedom of expression." He also commended the present Government's commitment in complying with the decision of the ECOWAS court to compensate the Family of the late Deyda Hydara. Nyangsarang Jobe, a lady, who was together with Ida Jobe, onboard the vehicle with Deyda when he was being shot, said it was indeed a great loss to the Journalism Fraternity. Sainey MK. Marenah a journalist working with the State Broadcaster said Government should ensure that the perpetrators are brought to book. "We as Journalists will not stop the fight until Justice is done for Deyda and other Journalists who were victims of the former regime," he asserted. Amadou Scattered Janneh who was the Minister of Information at the time when Deyda was killed said, "When the information was brought to Jammeh after Deyda was killed, his first response was, you see I have warned you guys about pushing this Press Freedom too hard". He added that "Jammeh said because these are the types of things that happen when you give these journalists freedom of expression, they may offend somebody and then these things happen". From the spot where Deyda was shot dead, participants proceeded in a procession to the Law Faculty of the University of the Gambia where a symposium was held. As the marchers moved on they chanted, "We need Justice! When? NOW for Deyda and Co". 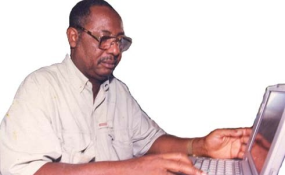 Deyda was a co-founder, co-proprietor and managing editor of The Point, a leading independent Newspaper in The Gambia founded on 16 December 1991. The late Mr. Hydara is a founder member and former president of the GPU. He was also a correspondent for both AFP news agency and reporters without borders for more than 30 years. He was killed on 16th December 2004 while returning home from The Point's office. He was accompanied by two female staff of The Point in the names of Ida Jagne and Nyangsarang Jobe. Twelve years on, his killers remain at large.